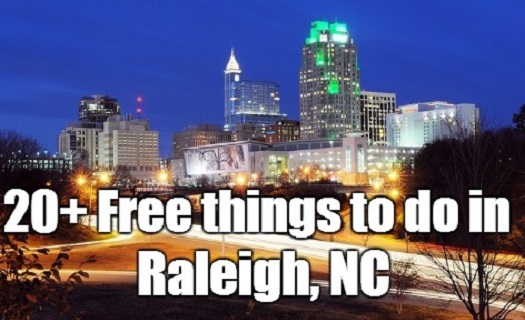 We have compiled a list of free things to do in Raleigh, North Carolina. Everything is kid friendly, fun for individuals, couples, or family. There is something for everyone! Also see the embedded Pinboard and Google Map below. If you have a suggestion please post it in the comments. 20+ free and fun activities. The only thing on this list that costs money is this museum but it is dirt cheap and well worth it. If you have kids, the Marbles Kids Museum is a must see; the kids will have a blast. This hands-on museum inspires learning. You can bring your own food and have a picnic, or eat at a nearby restaurant. Check the calendar of events on their website to see what special events are taking place on the days you may visit. The IMAX theater is right beside the museum as well. The Southeast’s largest natural history museum features live animals, dinosaurs, whales, walk-through dioramas, science education and research. Kids love this museum. There is something for everyone here. Admission is free, donations are optional. Located in Raleigh just off of Hillsborough Street. There are multiple entrances to this trail. Parking is available near: 1521 Crag Burn Ln, Raleigh, NC 27604. Vote on your favorite free thing to do in Raleigh!